The Multi-Objective Real-Valued Gene-pool Optimal Mixing Evolutionary Algorithm (MO-RV-GOMEA) has been shown to exhibit excellent performance in solving various bi-objective benchmark and real-world problems. We assess the competence of MO-RV-GOMEA in tackling many-objective problems, which are normally defined as problems with at least four conflicting objectives. Most Pareto dominance-based Multi-Objective Evolutionary Algorithms (MOEAs) typically diminish in performance if the number of objectives is more than three because selection pressure toward the Pareto-optimal front is lost. This is potentially less of an issue for MO-RV-GOMEA because its variation operator creates each offspring solution by iteratively altering a currently existing solution in a few decision variables each time, and changes are only accepted if they result in a Pareto improvement. For most MOEAs, integrating scalarization methods is potentially beneficial in the many-objective context. Here, we investigate the possibility of improving the performance of MO-RV-GOMEA by further guiding improvement checks during solution variation in MO-RV-GOMEA with carefully constructed Tchebycheff scalarizations. Results obtained from experiments performed on a selection of well-known problems from the DTLZ and WFG test suites show that MO-RV-GOMEA is by design already well-suited for many-objective problems. 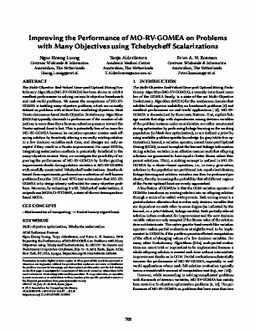 Moreover, by enhancing it with Tchebycheff scalarizations, it outperforms MOEA/D-2TCHMFI, a state-of-the-art decomposition-based MOEA.